The last several decades have seen the proliferation of Australian craft gin, whisky and rum producers. We have observed barriers being broken down to allow the growth of a previously stifled industry. While the noble craft of booze production has bourgeoned there has been the growth of other artisanal producers in other industries like chocolate. 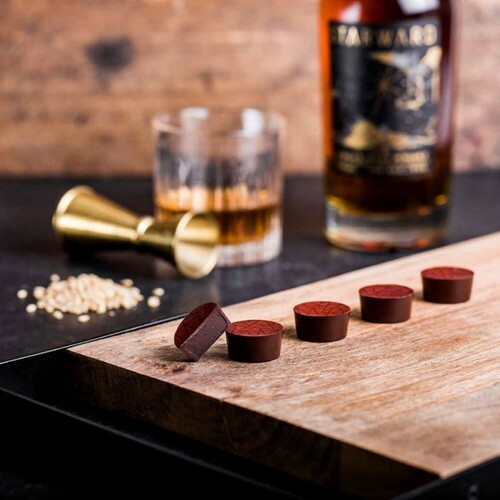 To celebrate Starward’s collaboration with Melbourne icons Koko Black, in October we will be presenting an indulgent pairing of chocolates that celebrate the growth of Australian craft distillation. Koko Black’s ‘Australian Spirit’ selection will be paired with a flight of craft spirits that demonstrate the mastery of several iconic Australian booze producers. Come and join us for a month of fermented fancy at Melbourne’s modern, urban craft distillery!